One evening in early February, I filled the bird feeders one last time before the day faded into darkness. 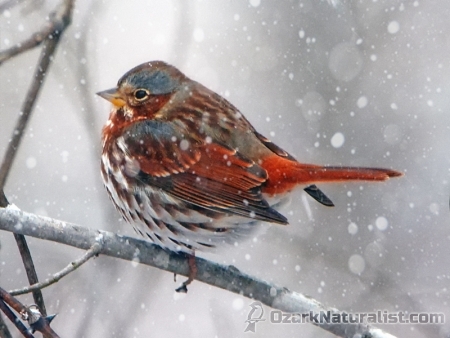 Cold gripped the Ozarks and the birds would appreciate the easy calories. On a lark, I sat in the truck, using it for a blind to wait for my customers to return. As the minutes passed, snow began to fall, but strangely, no birds came back to the feeders. They usually come pouring back from the trees as soon as I walk back towards the house. Finally, just before I called it quits, I saw movement in the Eastern Redcedar at the yard’s edge. A Fox Sparrow materialized in the brush next to the Redcedar, then another and a third. The snow fell more heavily and the light deteriorated even further, but I shot a few photos anyway. Had I been shooting film, I would have passed on the opportunity, but digital costs nothing and I shot away. The photos were dark and noisy. Brightening the image created even more noise. I almost discarded my work at this point but decided to run a de-noise filter first. And I’m glad I did. The falling snow and painterly feel combined to create a rather attractive image. At least I think so. I’ll take all the Happy Accidents I can get.